I've recently decided that I kind of love things made of feathers. Here are some photos that I've collected of some interesting things made with feathers. 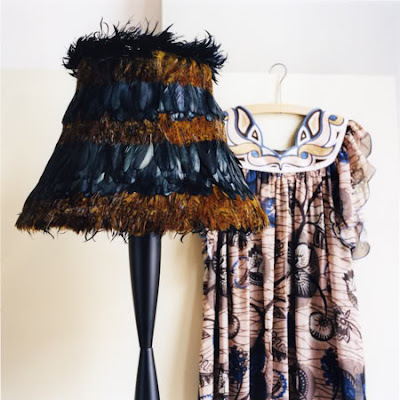 The photo of the killer lampshade above is a Katya de Grunwald photograph, curtesy of Mika78. The feather placemats are from eBay seller thefeatherworld and Etsy seller decorativeinstincts. The last photo is a selection of F. Schumacher's feathered wallpaper. Talk about adding some serious texture and drama to a room. They actually have quite a few feathered wallcoverings to choose from, all made with real feathers. Check out the entire selection here.